The first scoop of soil analyzed by the analytical suite in the belly of NASA’s Curiosity rover reveals that fine materials on the surface of Mars contain several percent water by weight. “One of the most exciting results from this very first solid sample ingested by Curiosity is the high percentage of water in the soil,” said Laurie Leshin, lead author of a study on the findings published September 26 in Science. She is the dean of the School of Science at Rensselaer Polytechnic Institute in Troy, New York. “About 2 percent of the soil on the surface of Mars is made up of water, which is a great resource, and interesting scientifically.” The sample also released significant carbon dioxide, oxygen and sulfur compounds when heated. 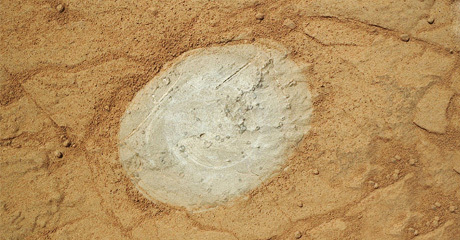 Above is a picture of the first Martian soil collected by the scoop on Curiosity’s robotic arm. Baking the sample also revealed a compound containing chlorine and oxygen, likely chlorate or perchlorate, previously found near the north pole on Mars. Finding such compounds at Curiosity’s equatorial site suggests they could be distributed more globally. The analysis also suggests the presence of carbonate materials, which form in the presence of water.